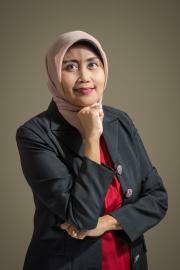 Mirna holds a master's degree in human resources and administration from the University of Indonesia, and an undergraduate degree in German literature. Mirna is responsible for ensuring that SMERU's administrative processes run smoothly and efficiently, and works closely with SMERU's board of trustees. Prior to her current role, Mirna worked within SMERU as a senior administrator. Before joining SMERU, she worked in a variety of administrative roles for Siemens Automotive, WijayaKarva and the Jakarta Export Centre.